Preface. The edible sea-urchins (J.M. Lawrence). Reproduction of sea urchins (C.W. Walker, T. Unuma, N.A. McGinn, L.M. Harrington, M.P. Lesser). Energy metabolism and gonad development (A.G. Marsh, S.A. Watts). Reproductive endocrinology of sea urchins (K.M. Wasson, S.A. Watts). 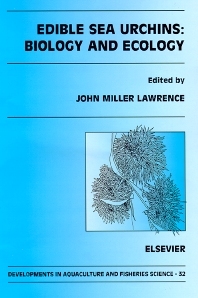 Echinoid larval ecology (L.R. McEdward, B.G. Miner). Growth and survival of post-settlement sea urchins (T.A. Ebert). Digestion in sea urchins (J.M. Lawrence, T.S. Klinger). Carotenoids in sea urchins (T. Matsuno, M. Tsushima). Disease in edible sea urchins (K. Tajima, J.M. Lawrence). The ecology of Centrostephanus rodgersii (N. Andrew, M. Byrne). The ecology of Loxechinus albus (J. Vásquez). The ecology of Paracentrotus lividus (C.-F. Boudouresque, M. Verlaque). The ecology of Psammechinus miliaris (M. Kelly, E. Cook). The ecology of Echinometra (T.R. McClanahan, N.A. Muthiga). The ecology of Evechinus chloroticus (M.F. Barker). The ecology of Heliocidaris erythrogramma (J. Keesing). The ecology of Strongylocentrotus droebachiensis (R.E. Scheibling, B.G. Hatcher). The ecology of Strongylocentrotus franciscanus and Strongylocentrotus purpuratus (M.J. Tegner). The ecology of Strongylocentrotus intermedius (Y. Agatsuma). The ecology of Strongylocentrotus nudus (Y. Agatsuma). The ecology of Lytechinus variegatus (S.A. Watts, J.B. McClintock, J.M. Lawrence). The ecology of Tripneustes (J.M. Lawrence, Y. Agatsuma). Sea-urchin roe cuisine (J.M. Lawrence). Sea urchins are a major component of marine environments found throughout the world's oceans. A major model for research in developmental biology, they are also of major economic importance in many regions and interest in their management and aquaculture has increased greatly in recent years. This book provides a synthesis of biological and ecological characteristics of sea urchins that are of basic scientific interest and also essential for effective fisheries management and aquaculture. General chapters consider characteristics of sea urchins as a whole. In addition, specific chapters are devoted to the ecology of 17 species that are of major commercial interest and ecological importance. • A synthesis of what is known about the basic biological characteristics of the sea urchin, useful for the direction of future research. • Case histories of 17 species that illustrate their ecological role in a variety of environments. • With the catastrophic decline in fisheries resulting primarily from over-fishing, it is essential that the populations be managed effectively and that aquaculture be developed. This book provides knowledge of the biology and ecology of the commercially important sea urchins that will contribute to these goals. • The only book available in present literature devoted to sea urchins. With this new title experts provide a broad synthetic treatment and in depth analysis of the biology and ecology of sea urchins from around the world, designed to provide an understanding of the group and the basis for fisheries management and aquaculture.